It was nice to pick up a needle again yesterday, and see some progress at the end of it … I managed to get amost halfway through my charity quilt block for Dylan H with Quilts4Kids. 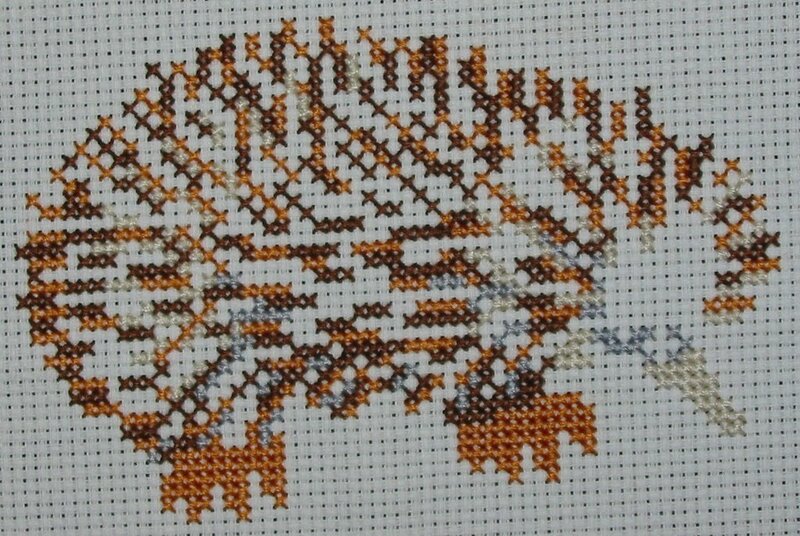 His theme is Australian animals and sites, and thanks to Sharon and Gina I had a few to choose from after sharing their Aussie stitching books with me – I opted to stitch an Echidna from “Sourcebook for Australian Cross-Stitch” by Vivienne Garforth. I hope to get it finished today, and I’m ignoring the much-needed housework today in order to get it done … and Fraze’s staying for a few nights this week again, so he says, so it’ll only need doing again afterwards, so probably better to leave the vacuuming etc until later … see, I can find a good excuse for anything! LOL. Carina, I’ll send you an email shortly – it would be great to see you in August 🙂 I wondered how you went about getting your ticket changed – at least when I get to my ‘proper’ shifts on the new job, I can tell months in advance what days I’m actually working, so we can slot something in. I’m not sure about Luna Park – I know there’s one in Sydney, so perhaps it is just owned by the same people? Not aware of any others in Aussie, but then again I’m not an Aussie, so nothing would surprise me! haha. ← It’s finally the Weekend! Love your charity block – super cute! I don’t think there are any rotation police… if there were, they would have gotten ahold of me last month LOL!! Awesome about your charity block! It’s gonna be cute. A few years ago, I did a square of about four Aussy animals for a girl from Love Quilts who wanted a quilt with an Aussy theme. Speaking of LQs, I’ve done about 30+ blocks for them in 7 yrs. I definitely fit them in my rotation and if I don’t do one for a while, I miss it! My family and me only have so much wall space, etc. and a quilt is such a special gift. Oh, the Echidna will be so cute when done! Saw one on TV and my daughter wanted one for a pet LOL, thank goodness I don’t think he’d do well in Canada 😉 I had a giggle over your mention of the Rotation Police. I have never been sucessful with a rotation yet so it’s a good thing there is no such thing! Hope you enjoyed your stitching time, that does sound like the perfect weather for stitching! Oh, I love this little critter. You have the cutest, funniest-looking animals there! This is going to make a great quilt square. you guys have the best animal life over there! I have always wanted a pet chinchilla. They are SO soft! so, i got the next best thing…my cousin used to kangaroo hunt, and I have one of his skins. I sorta got my pet chinchilla, my husbands hair is super fine and soft and I nic named him Chinchilla. I can’t wait to see your finished echidna.